The Sony 18-250mm review has been completed. As expected, it has a lot in common with the Tamron equivalent. I re-shot the 250mm photo crops in the Tamron 18-250mm review to match up with the Sony crops because I know people will want to compare. In unrelated news, and much to my horror, it seems Sony has stopped using the color silver on its lens boxes, replacing the silver portion with plain old white. I love the opulent look of Sony DSLR packaged products, maybe now I won't want to buy any more after this sudden and appalling marketing decision. Look for a chat room update in a few days! Time for another lens review, and it'll be the new Sony 18-250mm F/3.5-6.3. It looks an awful lot like the Tamron I reviewed this summer, but the specs read slightly different in several categories. A complete review should be ready by this weekend. Also for Sony fans, get your new A700 from SONYSTYLE.COM, free shipping ends Thursday. I've been asked if I'm going to get one, and the short answer is no. I might hold off for the full frame job. We'll see. As promised at the beginning of the month, I've completed the virtual hiking tour, this time it's the Finger rock trail to Mt. Kimball, here in Tucson, AZ. I hiked it this past Wednesday, and as usual, it was a great day. Also, I took along the nice Panasonic FX100 pocket camera. This time of year is much nicer than springtime, and there's more color now than during the spring. Do you feel up to a quick 5 mile hike to a mountain peak? click here to begin the 41 picture tour. 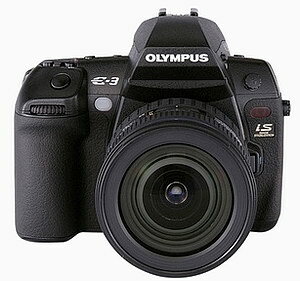 Olympus introduces their "flagship" DSLR, called the E-3. I can't help but think it's a year or so too late in the coming. With Sony gearing up to introduce a full frame, probably next spring, Olympus and Pentax will be suddenly at the bottom--at least in the so-called "professional grade" race. But let's not be too critical just yet, It might turn out to be a good camera, especially with the new lens announcements---expensive, like the Zuiko ED SWD 12-60mm $999 (24-120mm equiv) F/2.8-4.0, the 50-200mm $1199 (100-400mm equiv) F/2.8-3.5, and finally the 14-35mm $2299 (28-70mm equiv) F/2.0. Below are some specs for the new Olympus addition. Sensor shift image stabilization, with a hefty claim of a 5 stop advantage. 2.5" 230,000 LCD, with swing-out action. Another claim of "worlds quickest auto focus" with fancy dual 11-point biaxial cross-type AF system, (I was hoping for a triaxial or quadaxial system myself). Optical viewfinder with 100% FOV. Shoots at 5fps up to 16 RAW or unlimited JPEG. Dual memory card slots, xD of course and CF type I-II. 610 shots per charge with live view off. Anti-shock mode 1-30 sec. ?????? No AF illuminator, must use flash. Ships in November for $1699 body only. I've finished the macro lens shootout, and you'll just have to read the review to see how it all came out. If you're interested in reading each individual lens review, I have the Sigma and Nikon macros posted, but I'm still working on the Sony. That should be available in a week or so. The full size macro shots are on the regular review page for each lens, the Sony will be up soon. So sit back and enjoy the macro review, there'll be a couple of surprises as always. I finally snagged a Nikon 105mm F/2.8 VR "micro" lens as they call it, and it ain't "micro" at all. 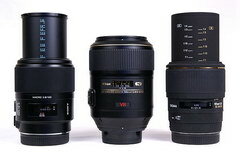 I'm going to do a Sigma 105mm, Sony 100mm and Nikon 105mm macro lens shootout for you--and me. Look for the article by next weekend or so. I'll do the regular lens reviews too. Take note; I've also put the August homepage stuff in the Homepage archives (on the Nav bar), so if you're looking for something that was on the homepage recently, look there. I haven't put any full resolution pics up for the Panasonic FZ18, I still have some bandwidth issues to contend with, so hang in there until I get that straightened out. On a final note; hiking season is right around the corner now, so look for a nice floor-to-peak tour of my latest adventure, with all my high tech toys involved. I'll add a new entry for the "Idle chat room" that I've been neglecting for too long, all coming to you this very October, which will be a busy month, so stay tuned!